Wichita State’s Shaq Morris enjoyed his 28 minutes, most of them spent jostling with Kentucky freshman Bam Adebayo, 6-foot-10 and 260 pounds. Morris picked up three fouls, a small price to pay for his performance and the feeling of freedom. Adebayo scored 13 points, 11 in the second half, and grabbed 10 rebounds. Morris scored 11 points and grabbed eight rebounds. Kentucky guard De’Aaron Fox is blazing fast and he turned on the jets for big baskets twice in the second half. The Shockers cut the lead to 61-58 on a three by Zach Brown and switched to a zone defense. Fox drove past Landry Shamet — while Morris had his back turned while guarding Adebayo and lobbied for a three-second call — for a dunk. Earlier, Fox gave Kentucky a 58-51 lead when he jumped into the passing lane for a steal and sped in for a dunk. Wichita State held Kentucky to its lowest point total of the season. The Wildcats made 23 shots, matching five other games. That is good enough defense to win against a team with three players (Adebayo, Fox and Malik Monk) projected as first-round NBA Draft picks. Wichita State survived poor shooting in the first half to trail 26-24. The Shockers missed 23 of their 33 shots and eight of their 11 three-pointers. They hadn’t played a team with elite athletic ability since November and it showed. 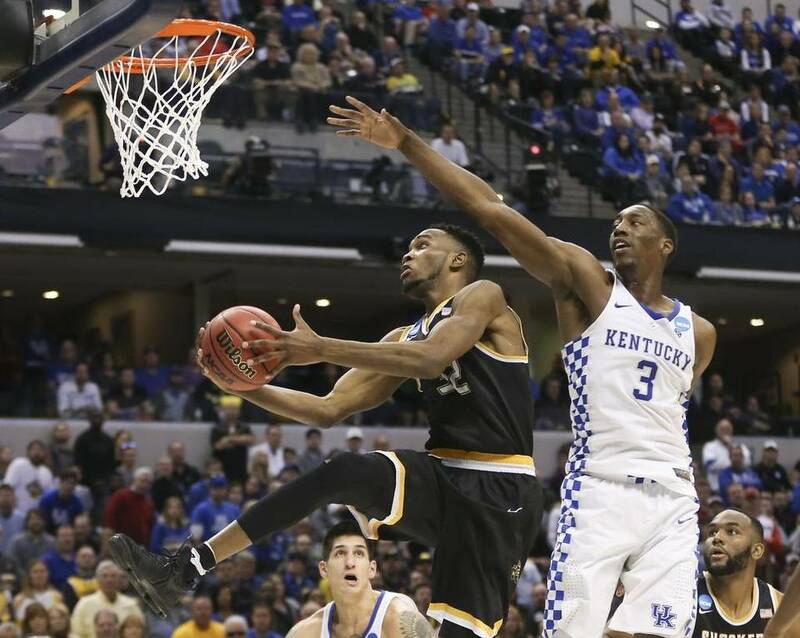 While Kentucky offered up more open shots than Dayton on Friday, it bothered the Shockers with its length. The Wildcats blocked two shots in the first half and altered many others by forcing the Shockers into awkward shots. Morris carried them with eight points and five rebounds in the first half. He fouled once, which allowed him to play 11 minutes. WSU made him the focus of the offense in the opening minutes and the Wildcats double-teamed him to take the ball out of his hands. WSU freshman guard Austin Reaves will undergo surgery to repair the labrum in his right shoulder now that the season is complete, he said. Dislocations sidelined him three times this season. He missed two games in late January and early February after dislocating the shoulder. He missed a game in late November after dislocating the shoulder against Michigan State. He returned eight days later to play at Colorado State. He also injured the shoulder during fall practices, limiting his workouts for around a week. Reaves, from Newark, Ark., had his right shoulder repaired late in his sophomore year in high school. The right shoulder dislocated for the first time during his sophomore season in high school when an opponent landed on him during a chase for a loose ball. Reaves had surgery to repair the labrums in both shoulders in the past four years. Last March, he underwent surgery on the left shoulder. That recovery kept him from practicing and lifting weights most of the summer. Wichita State is 18-15 in 14 NCAA Tournament appearances. … Kentucky is 123-49 in its 56 NCAA appearances (No. 57, in 1988, was vacated). … Sunday’s game marked the second time for 30-win teams to meet during the NCAA Tournament’s first weekend. In 2008, Tennessee (30-4) defeated Butler (30-3) in the second round. Sunday night, Cincinnati-UCLA marked the third time for 30-win teams to meet. … The Wildcats lead the series 2-0, both meetings in NCAA play.… Actress and Kentucky fan Ashley Judd sat near the court opposite the Kentucky bench. … Brown made 2 of 3 three-pointers and went 5 for 6 in two NCAA games. … The Shockers made 14 of 44 threes (31.8 percent) in the two games, far below its season mark of 40.8 percent. INDIANAPOLIS (AP) — A security guard asked the wife of Wichita State coach Gregg Marshall to leave the lower bowl of Bankers Life Fieldhouse after she started loudly cursing shortly after Sunday's 65-62 loss to Kentucky in the NCAA tournament. A police officer was eventually called and followed Lynn Marshall up the steps. She later was taken back to the playing level on an elevator so she could attend her husband's news conference. NCAA spokesman David Worlock says it is standard procedure for the wife of a coach to be escorted to the press conference but it is usually done by school officials. Lynn Marshall remained in the stands about 10 minutes after the final buzzer. She at first consoled fans and family members of the team's players. But then she started shouting loudly about the calls made during the game. Eventually, the people around coaxed her to leave and the police officer followed. Team spokesman Bryan Holmgren said the team was unaware of the situation and could not comment. INDIANAPOLIS – As the Wichita State band played and the cheerleaders locked arms, facing the team’s cheering section, chins quivered. Tears started to fall. Two shots had been blocked, a great NCAA tournament game had been lost, 65-62, and the Shockers’ souls were ripped out for the second time in the second round by Kentucky. The world’s best No. 10 seed had played with scant skill but voluminous grit, waging a fierce battle with the Wildcats. Down seven with just more than three minutes to play, they rallied resolutely. Facing a team stacked with NBA talent, a bunch of guys who weren’t recruited by Kentucky were close enough to grab a statement victory. And it eluded them. Ultimately, the future pros rose up and played like pros with the game on the line, while the Shockers hit their second-round ceiling. At the very end, they looked scared of the moment. Faced with the prospect of making a defining play against superior athleticism and talent, they shrank a bit. They looked like five guys who wanted someone else to take the big shot. Down by a point and in possession of the ball with 40 seconds to play, the Shockers dithered. They dribbled tentatively around the perimeter, they passed without great purpose, they hemmed and hawed. Coach Gregg Marshall was out of timeouts, which doesn’t happen often, so he couldn’t take control of the situation. Point guard Landry Shamet is a freshman and finally played like one, after performing brilliantly all game. Finally, with the clock draining to less than 15 seconds, Markis McDuffie rose for a 3-point shot. Somebody had to do something, but that wasn’t the best choice. McDuffie is listed as 6-foot-8. Malik Monk, listed 6-foot-3, soared to contest. He stuffed the shot before it could even leave McDuffie’s right hand, then corralled it and was fouled with 10.4 seconds left. Monk swished both free throws, and Wichita had one last chance to tie the game with a three. Shamet brought the ball upcourt and again looked tentative. Marshall said the plan was for Shamet to pass, but he moved off a screen onto the wing and there was no time left for passing. Shamet pump-faked to get defender Dominique Hawkins off the ground, then went up – and here came Kentucky’s Bam Adebayo to erase the shot and end the game and end Wichita’s season. Three years ago, No. 1 seed and undefeated Wichita watched a Fred VanVleet three miss at the buzzer of a second-round game against Kentucky. At least that one got to the rim, carrying the Shockers’ hopes and dreams with it through the air before thudding off. This time the last shot(s) never got that far. Marshall took the initial blame for the lack of execution in the postgame news conference. Then Shamet said, no, he should get the blame as the point guard. There was one other opinion aired in the Wichita postgame news conference, while Shamet was talking about the final seconds. “He got fouled,” said Marshall’s wife, Lynn, quite audibly. She was wearing a Wichita State jersey and sitting among reporters. It’s become fairly standard for some members of a team’s entourage to sit in on postgame news conferences – silently. Popping off about the officiating during one is a bit much. Lynn Marshall had just made a spectacle of herself for two hours, boisterously cheering for the Shockers and against the Wildcats and sometimes against the refs, too. This was standard operating procedure during games for Mrs. Marshall, as anyone in the Missouri Valley Conference will tell you. There are plenty of intense wives of coaches in college basketball, but she might be the most intense. 0 Response to "Shocker report: Kentucky 65, Wichita State 62"